Do you take people with disabilities hill walking, climbing or mountaineering? Get up to speed with the latest best practice at the BMC's inaugural disability symposium, with talks from paraclimbing world champion Fran Brown, mountaineer and quadruple amputee Jamie Andrew and climbing adventurer Andy Kirkpatrick. The BMC is hosting its inaugural disability symposium in conjunction with the Lake District Calvert Trust on 16-17 November. This two-day Continuing Professional Development (CPD) event based at the Calvert Trust’s residential outdoor centre in Keswick will give delegates the chance to learn new skills and techniques for taking people with disabilities climbing, hill-walking and mountaineering. The weekend is suitable both for experienced practitioners who will be able to keep up-to-date with current developments and share best practise, as well as people who have not worked with disabled people before but recognise it as an important area for their continued professional development. With workshop presenters and speakers including paraclimbing world champion Fran Brown, mountaineer and quadruple amputee Jamie Andrew and climbing adventurer Andy Kirkpatrick, this event promises to give you a host of new ideas to inspire and challenge you. ‘Climbing for All’. A day-long MTA certified course which is a great introduction to working with people with disabilities. As well as workshops, discussions and speakers, there will be the opportunity for delegates to gain experience by running activity sessions for people from the local area who have disabilities and wish to try out climbing or hill-walking. Thanks to funding from Sport England, the ticket price for this event is just £90. This includes two nights board and accommodation and entry to the full programme of speakers and workshops. Attendance carries 1 CPD point for MTA members. For more details and booking information please contact JillL@lakedistrict.calvert-trust.org.uk. "Do you take people with disabilities hill walking, climbing or mountaineering?" How about "Are you a disabled person who hill walks, climbs or mountaineers?" I appreciate the need for able-bodied professionals to become better informed, and it sounds like this event will be an excellent resource in that respect. But as a disabled climber, it's a little ironic and frustrating to click through excitedly at the news that there's going to be a disability climbing symposium, and then go "... oh. This isn't meant for me." Maybe the next disability climbing symposium could aim to include disabled climbers in its target audience as well? As people like Fran Brown demonstrate, some of us are quite good at taking ourselves places. In reference to point 2. I think that is a very fair comment. Instructors play a key role in people accessing the outdoors so this conference is targeting that particular audience. I definitely think there is potential for a conference in the near future which will target an audience of disabled people wanting to either access or develop opportunities in the outdoors. Just as a side the BMC do run a series of climbing competitions for disabled people which will be starting early 2014. I feel the same as the author of comment (2). As an amputee that likes to get out and about as much as possible I'd love to meet kindred spirits, share experiences and what works and doesn't. I was disappointed that this symposium wasn't aimed at people like myself. 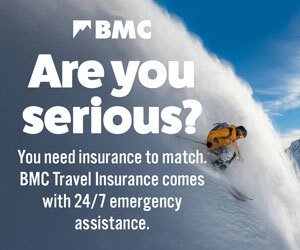 Come on BMC, get organising! As the commenters above have noted, this event is aimed at people who take those with disabilities into the outdoors rather than people with disabilities themselves - sorry to disappoint on this score. It's worth pointing out that people with disabilities are welcome to attend this event if they wish - the venue and accommodation are fully accessible and there will be parts of the program which will be interesting to all, such as the speakers. However the main focus will be on encouraging new skills and best practice among practitioners, so the bulk of the weekend i.e. the workshops etc will not be relevant. An event for people *with* disabilities has been discussed within the BMC and would be great, but it will take considerably more organising to make sure it fulfilled all needs. It's not outside the realms of possibility however, so watch this space. Just to add to a comment I made earlier (3) I would actually like to think that an event on accessing the outdoors wouldn't necessarily have to be specifically for disabled people. They could be a target group, but you could organise it where people interested in accessing the outdoors could come a long and within that ensure that all activities and events are fully accessible. Within this you could provide the option of exclusive on inclusive sessions. I am basing part of my opinion on the climbing competition which took part in Chamonix where disabled and non disabled climbers comps were run alongside each other. This I feel broke down a huge number of barriers and raised the profile of disabled climbers greatly. I got really excited when i seen this, should it not clearly say this expired or take it off.